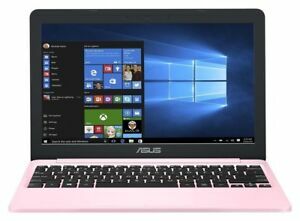 Details about ASUS E203 11.6 Inch Intel Celeron 2.6GHz 4GB 32GB eMMC Laptop - Pink. Immediate payment of £113.99 is required. refurbished but looks like new - really pleased with it! I bought it for my niece, and she like it especially the colour and weight.